A wonderful composition of 25 fresh red roses with baby breath greenery delivers the gentle feeling of adoration and love. A wonderful gentle coloured arrangement with decoratinve elements (pencils, of different colours) on a floral work. 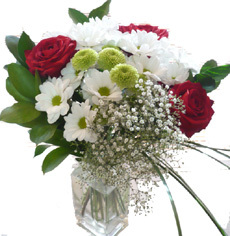 7 pink roses, gerberas, statitsa, ghypsophillas, chrysanthemum and greenery will be a distinctive present for the first school day or the graduation. Large arrangement contains: 26 roses of pink, white and orange colours, 25 ghypsophillas, 7 carnations, 2 statitsa, bergras, leukodendron, greenery and natural packing decorated with butterflies and artificial pearls. 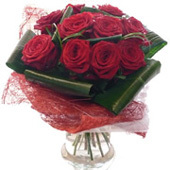 21 red roses with 7 gypsophillas, arranged with nice hidden coaster for table placement and table decoration. 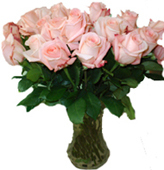 Peach roses 5 Fresh, long-stem roses with greenery and wrapping of unusual colour will show your care and attention! 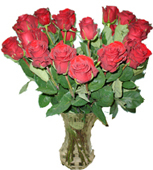 25 red roses in a small arrangement; 51 - medium; 101 - large. Roses go in the basket or arranged with greenery. Please, write your choice in the comments while placing the order. The picture shows large amount of roses. A free picture with each large order is guaranteed.